Hello peeps... How is your Sunday going on..?? Mine is just sleeping and resting at home.. Yesterdat I was out for shopping and returned home late night ,hence today I decided to not go out .. I bought lemons for my kitchen today and at that time one thing came in my mind that to draw a nailart inspired by lemon.. Then I started drawing .. wait wait somedays before I had tried lemon nailart too but that was not came out that much perfect,so not posted.. 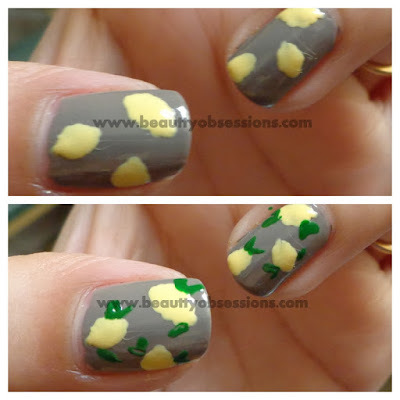 I will put that old picture as well at the end of the blog.. Well now move to the tutorial.. 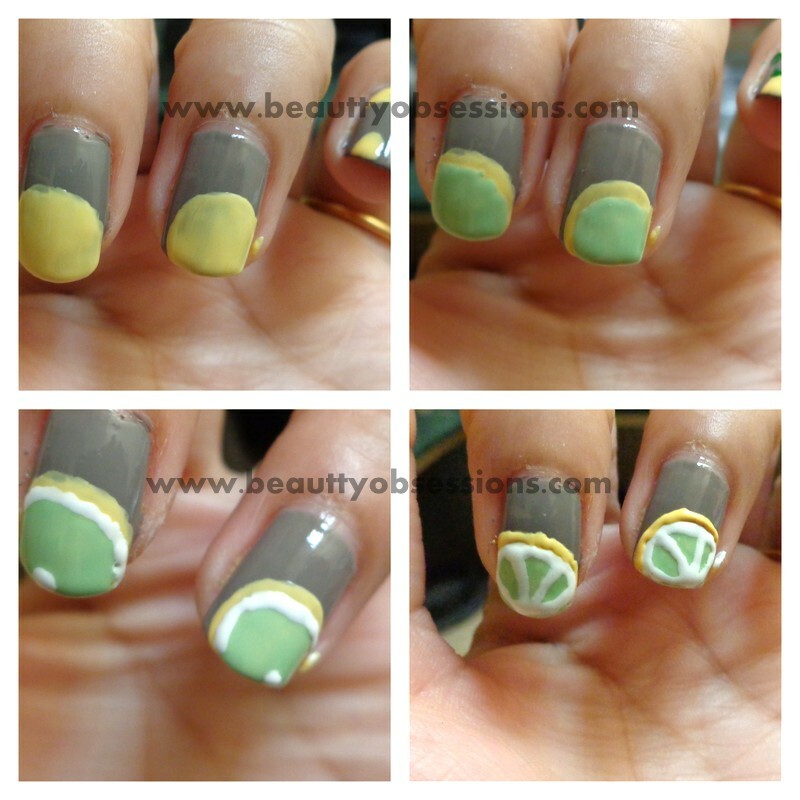 Here I have drawn three designs in total.. Below are the steps .. Do check..
1- First I have painted my nails with a darker nud-ish grey colour which I hav recently bought from Nykaa.. And on the pinky finger I have applied a pastel yellow shade.. Actually I don't have lemon-ish yellow shade,hence I used this pastel yellow. 2- Then on the index finger and middle finger i am going to draw the half lemon pic.. So see the below pic for your reference .. Here I have used a fine brush to draw the art..
3- Now its time to draw the lemons and leaves on the ring finger and thumb.. I have used a tiny head dotting tool to draw the lemons and leaves.. See the below picture to know how I drew..
4- At last I put few dots using the large dotting tool on the pinky finger.. After dried up ,applied a nice coat of top coat to lock the art... Done..
Wow. Its pretty and citrusy :) loved it. pretty design really liked it!! Yeah sure.. Do try and show us yours.. Thank you..